Liz Truss told a right-wing US think tank that “a thicket of regulation and control” is holding back business and called for a new “Anglo-American dream” while the group published details of a proposed deregulatory US-UK trade deal. Her speech – given at the Cato Institute during a taxpayer-funded trip to Washington – came as Cato and other right-wing think tanks launched a major report at joint events in London and US outlining an “ideal” free-trade agreement after Brexit. The proposed deal would threaten environmental regulations, remove current rules on imports of chlorine chicken and hormone-fed beef and open up the NHS to competition from the American healthcare industry. 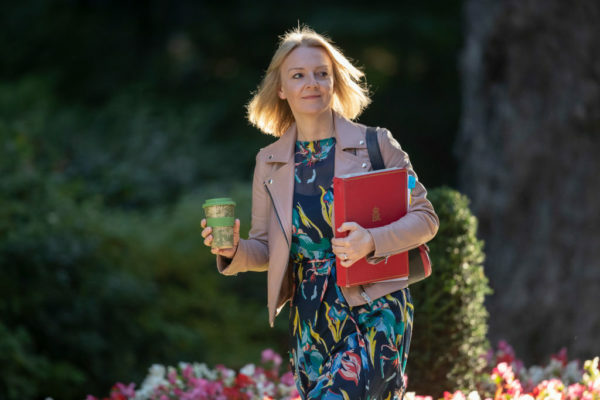 At the Washington DC launch of the report yesterday, Truss delivered a speech entitled ‘Market Millennials’ in which she described Brexit as a “huge opportunity” to “shape a new relationship with America” and “turbo charge freedom”. The DC launch was also attended by former UK environment secretary Owen Paterson, Utah Republican Senator Mike Lee, and MEP Daniel Hannan, who edited the report. Speaking at the London launch of the report in Westminster, the Cato Institute’s Daniel Ikenson said workplace and environmental rules do not belong in trade agreements, insisting that companies can be “self-regulating” when it comes to environmental standards. Ikenson also suggested “local farmers” had been “scaring” people about chlorinated chicken and suggested that “incumbent” providers such as the NHS should be opened up to competition as part of a de-regulatory trade deal. That report, an “ideal” version of a US-UK trade agreement, was a collaboration between 11 influential right-wing US and UK think tanks – including the Institute of Economic Affairs, which enjoys close ties to trade secretary Liam Fox and former foreign secretary Boris Johnson, and the Initiative for Free Trade. The report calls for an extensive free trade deal between the US and the UK, with no tariffs on any goods, reductions in regulation, and equivalence between the UK and USA’s rules, which could open up the UK to the sale of chlorinated chicken, hormone beef, and other products. In remarks at the report’s London launch, its primary author Daniel Ikenson, the director of Herbert A. Stiefel Center for Trade Policy Studies at the Cato Institute was blunt about its effects – and his view on regulation. Ikensen noted the report would allow the UK government to protect up to 10% of its service sector from the full effects of competition – but noted that even if this full allocation was used on the NHS it might not be enough to shelter it, given the organisation’s scale. Ikenson also admitted the “ideal” trade agreement the 11 think tanks had drafted included no protections for workers or the environment, and was dismissive of their existence. Amy Mount of the Greener UK coalition responded to Ikensen’s remarks to Unearthed. “This is a depressing vision for our future. Flooding our supermarkets with chlorinated chicken, undercutting our farmers and lowering standards for chemicals would be a strange way to take back control,” she said. At the launch, the report’s authors noted trade deals provided an opportunity to lock-in rules and prevent “backsliding”, dismissing concerns around trade deals and food as lobbying and scaremongering, attacking UK farmers in the process. “There’s a lot of politics involved [in trade deals],” Ikenson noted. “A lot of bootlegger and Baptist stories where you have interests that want protection … and they enlist the support of unknowing groups who have social consciences, for example they don’t want to eat chlorinated chicken – and chlorinated chicken, there’s nothing wrong with it scientifically, it’s available for sale.